George Graham reviews Elizabeth Geyer's "The Bridge"
As I have remarked in this series many times, the number of singer-songwriters on the music scene seems almost endless. Most of them fall into the stereotype of the folksinger, playing acoustic guitar and singing songs that were written with and for that kind of musical configuration. There have been a number of variations – pianist singer-songwriters are fairly common -- but this week we have something that is rather uncommon, a trumpet-playing singer-songwriter, and at the risk of perpetuating another stereotype, it's notable that the artist is a woman. She is Elizabeth Geyer and her new album is called The Bridge. Elizabeth Geyer is Australian and began her career as a jazz trumpeter, playing with various jazz groups and in backing bands for a range of pop performers, both in Australia and in the US. Her bio says that fifteen years ago, she was heading home from a big band rehearsal and she decided that she had enough of that and was going to set out as and concentrate on being a singer-songwriter, on which she had been working for a while. She would sing jazz standards, and her first and eponymous album, released in 2000, was a collection of the standards. She followed that in 2004 with a vocal album of her own songs called The Dream. Then she continued more of her singer-songwriter direction with her 2008 release On Patrol with the Jazz Police. According to her notes on the album, she felt she needed to be “ready” before doing another album, so it was about eight years since her last recording. She was looking for inspiration one day and came across an album by fellow Aussie, Paul Adams, who is known as an instrument builder and for making somewhat atmospheric music with native American style flutes. They became collaborators in the studio for this largely do-it-yourself project with Ms. Geyer. Meanwhile, in the US, the late record executive Bruce Lundvall, who was in charge of Blue Note Records, got to hear Ms. Geyer's music and became a fan and helped to open some figurative doors for Ms. Geyer, whose music shows her jazz background. The Bridge is an always-interesting collection of original songs with the harmonic complexity of jazz tunes, and the storytelling narrative lyrical style of folkies. Paul Adams' New Age influenced music is also a factor, with many of the songs having an airy sound. Ms. Geyer and Adams handle almost all the instruments and share in the production credits. They did bring in a drummer and bass player for two of the tracks, but otherwise the layered sound consists of Ms. Geyer and Adams. And adding a distinctive touch is Ms. Geyer's use of the trumpet and fluegelhorn, which she plays with a more textural approach rather than that of a jazz trumpet soloist. Closing the album is a short instrumental piece called Rose, which spotlights Paul Adams' guitar, while a chorus of Ms. Geyer's wordless vocals provide some texture. 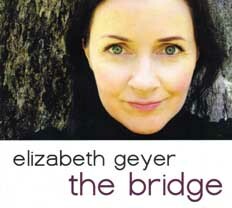 Australian singer-songwriter and trumpet played Elizabeth Geyer's new fourth album The Bridge is a very distinctive and thoroughly enjoyable blend of pleasing vocals, musically sophisticated composing and arranging, and the kind of poetic lyrics that are on the par with the best singer-songwriters. A trumpet-playing songstress is a rarity, though not unprecedented. In 1997, we featured an enjoyable recording by Kami Lyle whose instrument was also trumpet. Ms. Geyer's arranging and vocal style also recall another fine singer-songwriter who plays the piano and shows classical influence, Anna Dagmar. But still it's a distinctive and engaging sound. Our grade for sound quality is close to an “A.” The vocals are well recorded, the sound is honest and warm even with a lot of overdubbing. The dynamic range, how well the recording tracks the difference between loud and soft, is better than the average for contemporary music. The range of singer-songwriters is wide indeed, from the solo folkie to those who would sing in front of a large group. Elizabeth Geyer's new album The Bridge provides yet another facet, and in the process gives us something that is not only rare but exceptionally well done and musically creative. (c) Copyright 2016 George D. Graham. All rights reserved.